Windsong II and its crew (Bob and me) left Stuart on Monday, March 14 with buddy boat, Tranquilizer (with Marco and Beatrice). We crossed the Florida Straits and the mighty Gulf Stream on Tuesday, a journey of some 10 hours. The black circles show where we left from in Florida and where we made landfall in the Bahamas. The image above is of the sunrise over the ocean as we crossed, having left Palm Beach Inlet at 4:30 am. 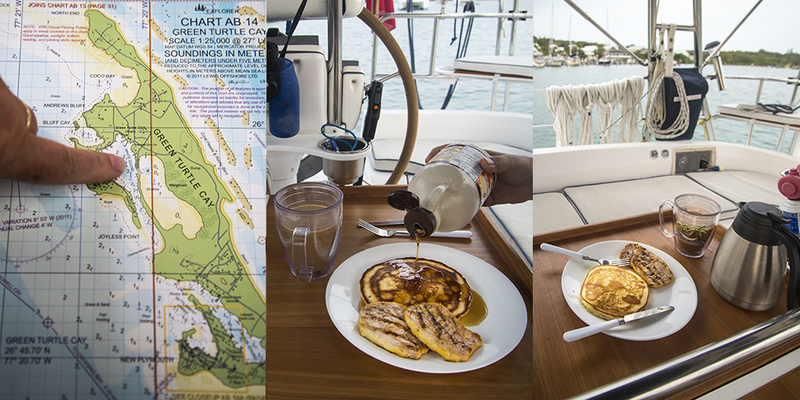 On Friday, we reached Green Turtle Cay. You can see how protected the anchorage is and we are also on a mooring ball. We will spend enjoyable time here as we wait for some bad weather to pass over. Yesterday, we had a relaxing breakfast (for a change) of pancakes and pea meal bacon (aka Canadian bacon) given to us by a kind friend before we left Florida. I love reading about your travels and am always learning more of the boating jargon, such as “buddy boat”. Showing the map is an excellent idea. Glad you made the crossing safely, Sherry. Now off to great adventures! Looking forward to following your time there, here. Love the pictures you take, so keep them coming. Off to a great start and happy for that!